Nair is the #1 hair removal product. As a young teen, my mom had two rules about hair removal and shaving. 1. Never shave above the knee. At around age 13, she walked into the bathroom and caught me with one leg up on the toilet, shaving my leg all the way toward my thigh. I didn't even have any hairs there! I just didn't know better. 2. Never trust a cream or ointment to remove hair from your legs. Mom always steered me away from products such as Nair. She insisted they cause allergic reactions. She swore there was something disturbing about burning the hair off of one's legs. Because the idea upset her so much, to this day, I avoided Nair. The way Nair works isn't nearly as frightening as Mom made it sound. The depilatory basically just combines two chemicals breakdown the keratin which helps dissolve the hairs making them wipe away with a wet cloth. Today Nair is still an extremely popular hair removal product. If you happen to be a male reader, don't fret, Nair has an entire line of male hair removal products for you as well. Check out this retro '80s commercial for Nair. Oh, how we loved the "short, shorts" commercials! 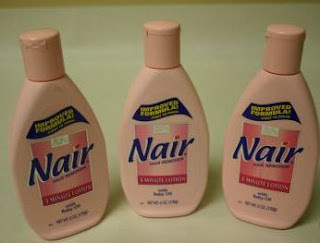 PS Does anyone remember when Halloween pranksters would empty bottles of Nair into old socks and threaten to hit you on your head so you'd lose your hair? Wonder if this was just a Long Island thing. The ONLY time I ever tried the stuff, it melted my legs! Oh gawd, Nair. I tried it once when I was a teen. Never again!!! Such a huge rash. I forgot how annoying that jingle was. You sure do get our memory banks going. I heard about people swapping out bottles of shampoo and putting in Nair, but maybe that was a middle school horror story. Speaking of horror, Epilady? OMG OUCH! I did use this a few times back then but couldn't stand the smell of it so I stopped. I definitely remember the commercials. I hadn't heard about that Halloween prank but I did hear of what Riot Kitty mentioned. I was never tempted to use Nair or wear short shorts but I remember the song and commercial. I'm with Riot Kitty; the real horror was the Epilady. My older sister and I got them for Christmas when I was 11 or 12. I think I tried using it only once. Pretty sure it would violate the Geneva Conventions to use it on POWs. Fourth Grade Nothing Fan Mail Rocks!